Photographic records for patient documentation are an important tool for treatment planning and require very specific camera selections, exposure settings and patient positioning to achieve undistorted, well exposed images. Are you using patient photography to its fullest but not satisfied with the results? Do you use your clinical photographs only for treatment planning and patient records? Then you are missing out on an excellent opportunity to show off your great work. Rita looks forward to working with your team to implement digital photography using standardized clinical photography techniques and exposure calibration of your camera system for consistent results. She creates an environment in which this new and seemingly complex technology can be learned in a fun and stress-free manner. A website has become a basic requirement for any business, especially a dental practice. Web sites are ALWAYS a work in progress. Too many dental sites are developed but never updated. Keep the site vital and fresh by adding content and updating on a continuing basis with your own photographs that will reflect the type of practice that will convince a potential patient that yours is the dental practice for them. Are you looking for a dynamic high-energy speaker? Is your group interested in the latest in digital photography, communication skills and case presentation with digital photographs? Rita Bauer is one of the most sought after speaker in this field and has a proven track record of delivering outstanding presentations. 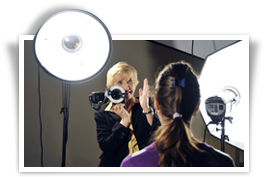 Many dentists look for a smaller and lighter camera system. Some cameras will give very good results, but they will not match the quality and control for standardization of a Single Lens Reflex Camera.